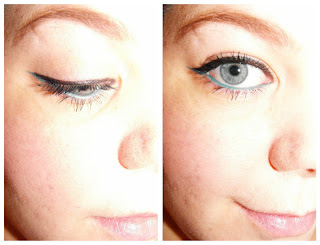 Sophsterlicious • UK Blog: Face Of The Day : Black Winged Liner. Gee, I never realised how similar this actually is to yesterdays look, as in the clean lid with blue liner, it must be the 'in' thing for me at the moment, without me realising. I actually did this look a while ago, but forgot I had it to post on here, I did it when I purchased my fluidline cos I was dying to try it out. It's not the neatest cleanest line, but you get the idea, I just wanted to go really clean eyes with nice liner. and that is all.. :) I'll try to show you some more interesting FOTD's soon! Very very pretty! Nice and elegant.